After getting rained out on Glencoe Days weekend, the Buffalo Creek BMX state qualifier has been rescheduled for Sunday, July 27. Riders from across the state will pump and pedal around Glencoe’s course starting at 1 p.m. 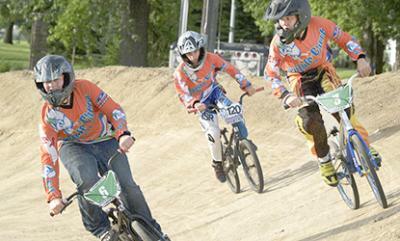 The night before will host the Race for Life, where riders can also earn double points, starting at 7 p.m. Pictured in this file shot are Dalton Pouliot (6), Jesse Mackenthun (120) and Earl Janke (3) during the 13 Intermediate moto back on June 10.